Suddenly there are hopeful signs of Spring and the final concert of the 2015-2016 South Okanagan Concert Society season is upon us. Friday, March 18th at 7:30 pm Venables Theatre will see a rarely heard live performance of classical and jazz music blended and titled “Common Ground”. The Wolak/Donnelly Duo will be on stage working their magic. Famed British composer, Richard Thompson, once said, “What I wanted to hear didn’t exist, so it was necessary for me to go out and create it.” Did the Wolak Donnelly Duo overhear him? 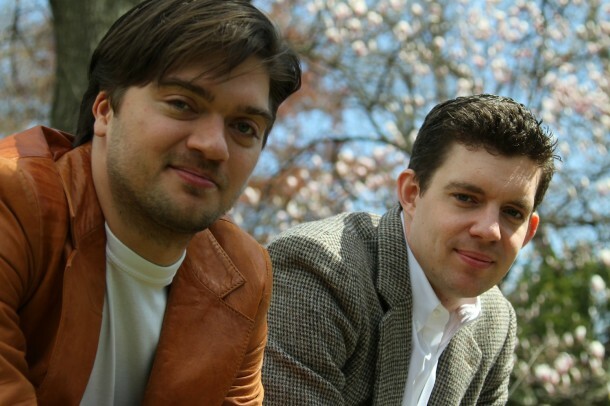 Clarinettist Kornel Wolak and pianist Chris Donnelly have worked together to show how jazz and classical music can more than just get along. Wolak is the classical expert, most recently seen in the principal clarinet chair with the Ontario Philharmonic. Donnelly is the jazz guy. Both cross musical borders to produce a concert repertoire that can include movements from Brahms’ great Clarinet Sonata, Op 120 as well as Oscar Peterson’s sparkling Hymn to Freedom or Gershwin’s famous Rhapsody in Blue. Together, Wolak and Donnelly captivate audiences with virtuosity, familiar melodies, and a profound passion for music and performing. Both musicians are personable stage presences and throughout the program they are able to showcase their talents as solo artists. Highly praised on two continents for his “pure silk” glorious tone, precise technical control and musical imagination, Polish born Wolak has a well established career as a soloist and chamber musician. Canadian born Donnelly is a Juno nominated pianist, composer and improviser. Theirs may be an unlikely pairing but all accounts point to an evening with a mix of styles, some humour and exceptional performance skills. Tickets for the event are on sale at Beyond Bliss in Oliver, Imperial Office Pro in Osoyoos and at the door. Single admissions are $20 and those 17 and under are welcomed to all concerts free. The posh new venue of Venables Theatre is wheelchair accessible. Those requiring transportation from Osoyoos can call Maureen at 250 495 7978. Bring your cheque book along when you arrive. Next seasons tickets will be on sale for Early Bird prices. Contracts are in the process of being signed and the line up will be made public soon. Music is alive and well in the south Okanagan. Make sure you are part of it!